Package of 3 needles for Hand Work. Appli-bond needles are a great asset to this technique. Each needle has 3 bayonette cutting edges and pierces the bonded fabric with ease. They are also helpful when doing the button-hole stitch on fusible applique. 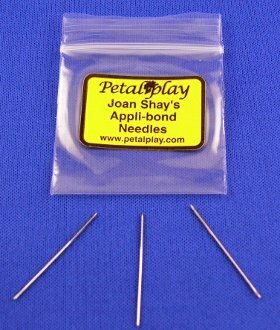 Used by Joan Shay in her Petal Play and Straw Wreath and Pinecones patterns (sold separately).